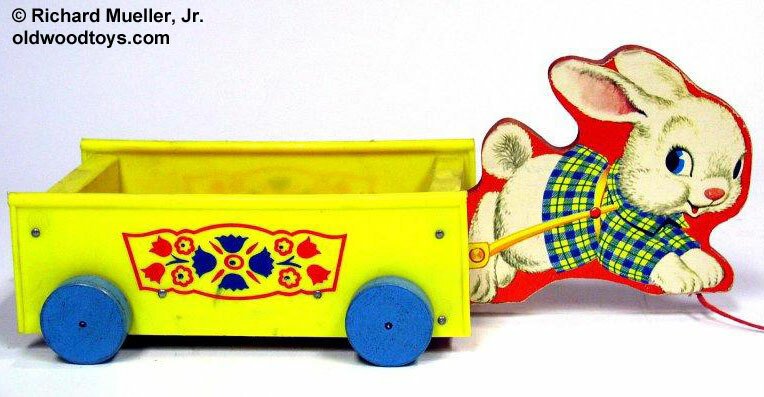 Description: This toy has a large roomy wagon that is pulled by a smartly dressed wooden rabbit. When pulled, a concealed bell makes a "ding-ding" sound. FPT4159 - Wooden cut-out bunny with paper lithographs on both sides of a white bunny in a running position wearing a green, blue, and yellow plaid jacket. Bunny has big blue eyes, a smiling face, and a yellow harness and cart handles on his sides. Bunny's back feet are attached to a rectangular wooden wagon. The wagon has a red floor and designs on all four sides of flowers. The wagon rolls on 4 blue wooden wheels (no wheels under bunny). A hidden bell rings as the toy is pulled. Measures 13" long, 5" high, and 5-1/4" wide.